So anyone that was hoping for the dark and gritty reboot of the 80s undercover cop drama 21 Jump Street in the same way that Michael Mann rebooted Miami Vice, they will be disappointed with what has actually been made. Instead, this is a delightfully funny and wild take on that material, which is like a crack-addicted blend between John Hughes and Lethal Weapon. 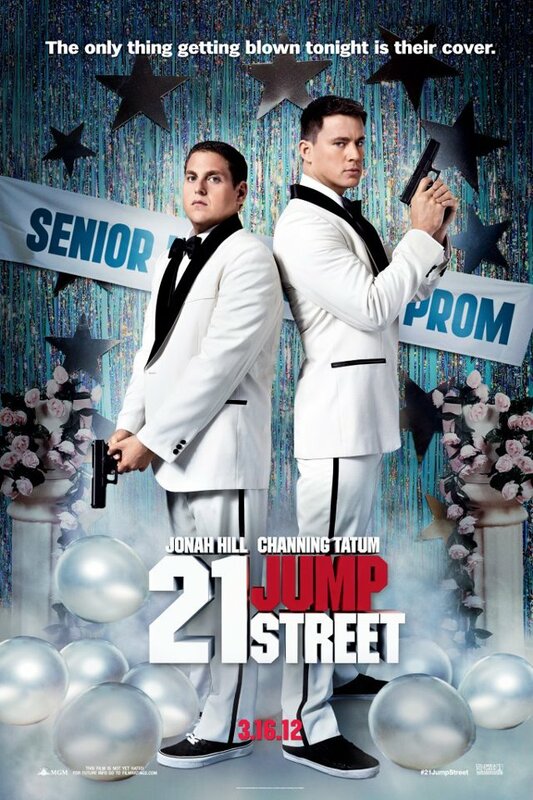 This new take on 21 Jump Street maintains the same basic premise of assigning cops to undercover roles as high school kids, but ups the raunchy factor significantly. The film is at times crude, but also a lot cleverer and more self aware than one would expect. 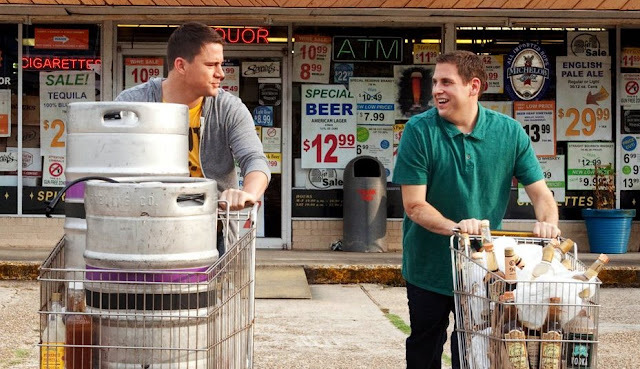 It is entertaining in a wonderfully over-the-top sort of way, with Jonah Hill and Channing Tatum making for a great comedic team. The film begins in the mid 2000s, where we meet Morton Schmidt (Jonah Hill), a spitting image of a young Slim Shady…except with braces and about 50lbs heavier. He is taunted at high school by the dumb, long-haired jock Greg Jenko (Channing Tatum), but the two have separate issues when it comes to girls and grades. Cut to present day, the two have become friends, after discovering each other again, while at police academy. 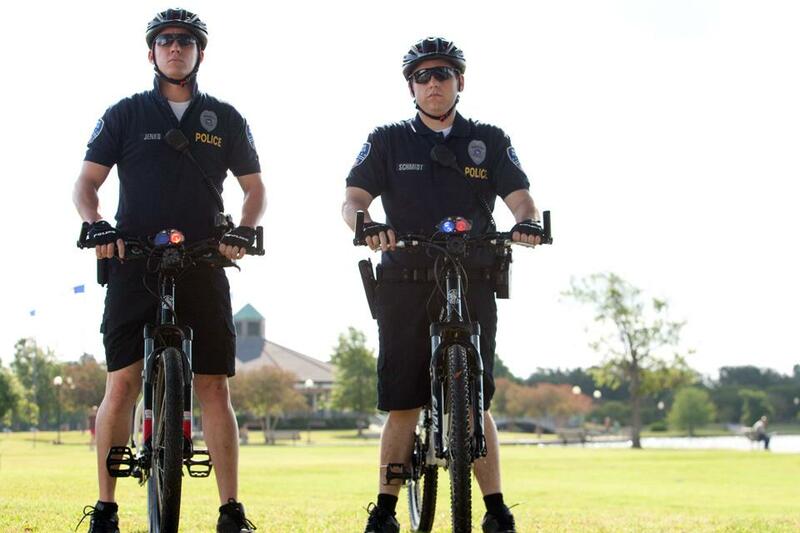 Upon graduating, the two spend their first duty as bike cops, looking for action. After unsuccessfully stopping a gang of drug dealers (Schmidt can’t shoot and Jenko can’t remember the Miranda rights), the two are given new orders to report to 21 Jump Street. At their new headquarters, Schmidt and Jenko are given a new mission from their Captain (Ice Cube). The two will pose as high school kids and work their way into the various networks to find out who is supplying a new drug that is spreading wide amongst the kids. In taking on this mission, the two immediately screw things up by not only making bad assumptions about high school, not being aware of how things have changed, but by accidentally switching their cover identities. Schmidt is now supposed to pose as a popular jock-like kid, while Jenko is supposed to be a book-smart, chemistry nerd. Regardless, the two will have to do their best to make connections with the popular kids to complete their mission, while also getting another chance at reliving their high school years. As mentioned, the origins of 21 Jump Street stem from an 80s TV series, which is what initially brought Johnny Depp into the public eye. That series was a serious procedural that dealt with topical issues and crimes that faced teenagers in high school. This reboot is anything but that. Where the original series may have dealt with kids with alcohol or drug issues, this film has Hill and Tatum purchasing alcohol and stealing drugs from an evidence locker in order to throw a party to gain popularity. The 2004 reboot of Starsky and Hutch came to mind, as that film similarly threw away the serious aspects of the series that inspired it and went for being a goofy comedy instead. The difference between that film and 21 Jump Street, however, is the R-rated nature of the shenanigans and action that Hill and Tatum’s characters involve themselves in. The true joy of this movie really does belong to what these two leads are capable of. It is not too surprising that Jonah Hill was able to supply a lot of laughs. Even now, as he is notably trim, the guy is fun to watch, whether he is faking his way through theater class or trying to maintain his cover by physically threatening an elderly neighbor. The real surprise is Channing Tatum, who is not simply a dumb and pretty weight to attach to Hill. I may have gone from ‘meh’ to acceptable regarding Tatum in general, but after this film, I am all over the Channing Tatum train. The dude made me laugh a lot in this movie. Regardless of how scripted his work may have been, Tatum showed true comedic timing throughout and tossed out hilarious one-liners and bits of banter very well. The supporting cast is also pretty fun. Notably Ice Cube, who is very aware that he’s playing the angry, black captain (he’s literally acknowledges this), but is so foul in this movie, it’s hard not to laugh at his ridiculousness. Then you have small roles filled out by Rob Riggle as the gym teacher, Ellie Kemper as Tatum’s horny teacher, and a few other brief cameos. Brie Larson and Dave Franco come in as high school students, with the former serving as the required love interest, who provides a fun balance for Hill, while Franco works well as playing up a particular image of what is ‘cool’ for high school. This film was in planning for a while before Jonah Hill finally helped developed the story; eventually having it scripted out by Michael Bacall (who co-scripted Scott Pilgrim Vs. The World, as well as the recent Project X). The aspect that had me most excited about all of this was the fact that Phil Lord and Chris Miller were handling directing duties. Lord and Miller were previously responsible for the short lived, but hilarious MTV animated series Clone High, but also made the much more successful film adaptation of Cloudy with a Chance of Meatballs, which has become one of my favorite animated films, let alone comedies of the past few years. With these two arriving in live-action, R-rated territory, I was happy to see a lot of the same style of humor in the visual gags and some of the dialogue coming through. Given that the film has a satirical bent to handling its clichés and openly acknowledging the very fact that it is a reboot, a lot of scenes take a few turns that feel random or obscure, but in a very funny way. There is some fine comedic craft at work here, which makes me excited for eventual repeat viewings, to catch more of the gags overlooked, let alone the Blu-ray release, which will no doubt be packed with cut footage. If there is anything to comment on, it is in regards to how much this film tries to do. There is so much material packed into this film, as it is essentially putting in a lot of elements from a season of the show or at least a multipart arc, that it feels like there were a few loose ends and lack of resolution for some of the little details introduced into the story. Additionally, while mostly well-paced, the action sequences in this film (which are fun) seem to drag down the film in a way, given how much comedy-related energy it has. With that said, some of the visual gags that come as a result of the action in this film provides for some pretty hilarious results. There is also something to be said for the level of sweetness found in this film, which is actually significant, even if it also moves the pacing down a bit. With two hilarious leads, a fun take on an old TV series, and a very heavy emphasis on being very silly, while adding a dash of wit, have made for a pretty successful comedy. The laughs come frequently and everyone seems to not mind both being in on the fun and making fun of themselves in the process. This film may not take the premise of the original series very seriously, but I cannot imagine anyone really caring that much. This is a funny film, with some pretty great laughs throughout. And one of those laughs involves Channing Tatum saying “F*** you” to science. Schmidt: When did I get stabbed? That’s awesome!